Correct and protect your paint with two huge names in car care! One of our most asked questions is, “What should I use to remove swirls?” While there are many options, the answer is Pinnacle. Their swirl removers are second to none in terms of ease of application and results. Speaking of application, we can’t say enough about the Porter Cable 7424XP. It seemed only natural to bring the two together in the Pinnacle Porter Cable Kit. Take a look at all the exceptional products you get in this package! Made of indestructible urethane, this backing plate holds pads securely while you work using hook & loop backing. The edges of the plate are beveled and flexible to prevent accidental bumps with your paint. The backing plate has a 5/16 inch thread. 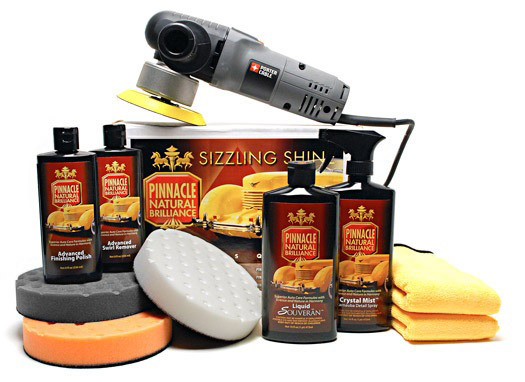 Detailer's Tip: Mist the foam pad with Crystal Mist prior to applying a polish or wax. The damp pad will spread the product more easily than a dry pad. Firm, high density foam for scratch and defect removal. Use this pad with polishes and swirl removers. It’s an all around pad that will work on most light to moderate imperfections. Apply Pinnacle Advanced Swirl Remover with the orange light cutting pad. Though some swirls are inevitable, the Pinnacle Porter Cable Kit will give you the resources to restore your finish to its optimum showroom condition. The Porter Cable buffer is fantastic. Been a long time since I used a buffer and this one is perfect for the job. Nice knowing you won't burn the paint by pressing to hard. It works as well as the demo video provided by Auto Geek. ProsWorks great! I never used the Pinnacle products before and now I won't use anything else. I used it on my 1999 GMC Sierra, with original paint. It shines as good or better than my 2015 Cadillac. Can't wait to use Pinnacle products on it. Product was as described and shipped in a timely manner. I am happy and will order again. Always have taken exceptional care of my vehicles with conventional products. Envious of other people who had their cars professionally done to get a better shine and overall results I made the investment. Great decision to say the least. Easier to use than I thought, faster process with less effort and, best of all I did it myself. ProsEasy to use, great video instruction, outstanding products that live up to their claims. I have detailed cars for over 35 years and have never gotten this good of a result in the amount of time it took with these products. Both the Porter Cable DA and the Pinnacle products delivered exceptional results. The small amount of product needed for each step makes the premium price of the Pinnacle products a relative bargain. ProsTerrific results by following the instructions. Easy to use. ConsConsiderable vibration on the side handle of the DA. I would advise the use of a glove for that hand. Pinnacle porter cable and swirl remover kit. Love this produce. My 2005 Class A camper has oxidation and some scratches. The front door was always dirty looking. With the oxidation the dirt would not come off. After using this product it shines!!!! The new dirt wipes off easily. The kit came with how to instructions made this very easy for me to use "female". I was using this at a camp ground on my camper and a fellow camper came up and commented how impressed he was that I could use a "buffer". I watched the video that came with kit and it has been very easy. SO impressed with the results. Would buy again!! !